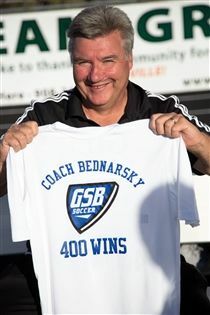 400 GSB Wins for Coach Tony Bednarsky! 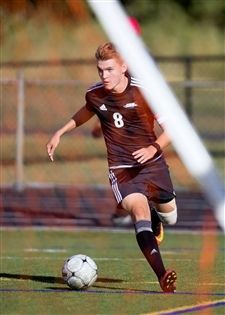 Varsity boys' soccer bested Somerville High 1-0 this afternoon thanks to a second-half goal from Bailey Gano '18 off an assist from Steven Bednarsky '17. 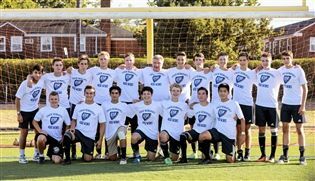 The win brought the team to 2-1 for the season and marked a major milestone for head coach Tony Bednarsky: 400 wins with Gill St. Bernard's. After the victory, the team broke out a box of commemorative T-shirts that senior Cam Miller had designed. 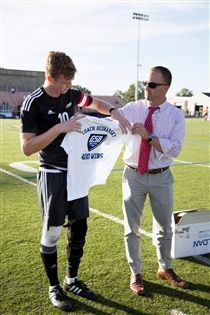 On the front, the jerseys read "Coach Bednarsky, 400 wins, GSB Soccer," and on the back: "A great coach is hard to find, difficult to part with and impossible to forget." 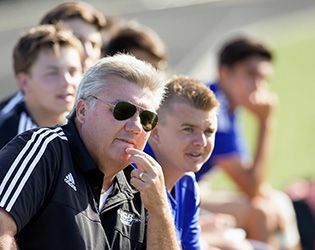 When asked about today’s win and the career achievement, Bednarsky—who has been head coach of boys' soccer at Gill since 1989—offered simply, "It’s a great group of kids; I’m just along for the ride." So what’s next for this team and this coach? The Star Ledger predicts Gill will be "one of the best teams in the state" this year. Ask any of the seniors on the roster, and they’ll tell you they want it all this season. Each of those boys remembers 2013, their first season on the team, and the year they won the state championship. Getting back the state title has been their goal ever since, and this year represents their last, and perhaps best, chance to do it. Four of those seniors [Steven Bednarsky, Kevin Brito, Cam Miller, and Anes Mrkulic] made the Star Ledger’s “players to watch list,” an honor shared only by Delbarton—last year’s non-Public A champs. 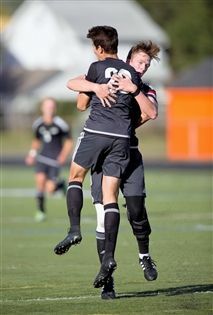 Brito and Mrkulic will be expected to take the lead in scoring this season. At midfield, the team will look to the talented Bednarsky—recently named to the All-America watch list—and to the defensive contributions of Miller. Rounding out the senior lineup are two versatile midfielders: Armeen Mozafarri and Jack McMahon. Among the juniors, Gano will be an important contributor at midfield, and the team will continue to depend on the work of goalie Alex Roch '18, whose four saves helped bring Gill today’s win. Promising underclassmen on the team include John Baber '19, Tyler Merna '19, Nick Kovalenko '20 and Daniel Shen '19. Looking ahead to important matchups this season, the team will face Immaculata—a key conference game—on September 24 at GSB Family Day. 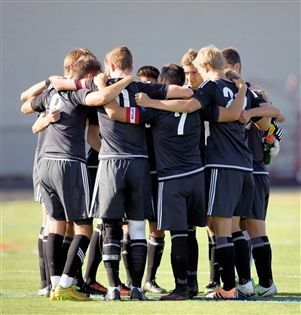 On October 8, the boys will take on Pingry during homecoming on the Basking Ridge campus. Having defeated rival Bernard’s High 3-2 in overtime on September 13, the rematch on October 11 promises to be an important contest as well. In addition—although the game holds no conference implications—the boys are slated to play St. Benedicts Prep, ranked number one in the nation by USA Today, at home on October 19. In addition to coaching, Bednarsky is a history teacher in the Middle School, and he and his wife Donna have sent four children to GSB, graduates from '08, '10, '14, and current senior Steven. Reflecting on her husband's milestone win, Donna, who teaches physical education at Gill and is a former, and formidable, varsity girls' soccer coach," said "It's a relief. There will be peace in the house again." Congratulations to Coach Tony Bednarsky. Go Knights!